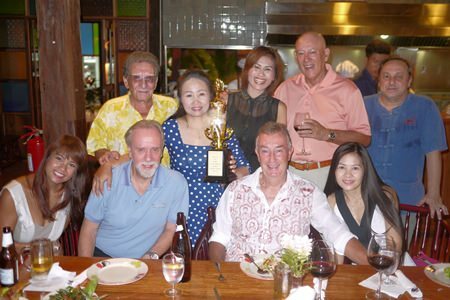 Dave Anichowski (far right) joins partygoers at the River Market on July 10, 2014 to celebrate the appointment of Lexsana Ketanee (center) to the Ladies Pro Golf Association of Thailand recently. 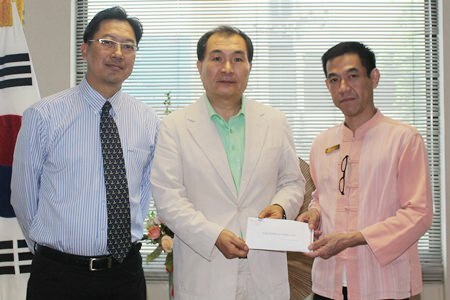 Dr Chansiri Suetrong (left), Executive Vice President of V Group, the parent company of Centara Khum Phaya Resort & Spa, Centara Boutique Collection and Jerome Sim (right), General Manager of the hotel, present a donation for the families of those lost in the Korean ferry disaster to Kim Chul Sik (center), President of the Korean Association in Chiang Mai. 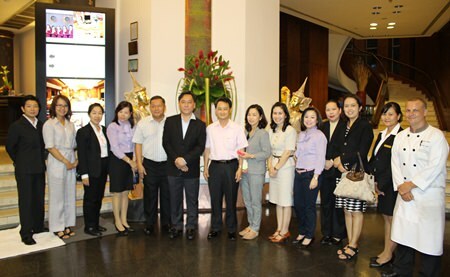 The Management team of the Imperial Mae Ping Hotel was joined by the Management team of TCC Siri Lanna Company Limited recently to welcome Chiang Mai Governor Suriya Prasatbuntitya and his wife Mananya at a welcome dinner at the Imperial Mae Ping Hotel. Famed Thai - German pop star Mario Maurer joined a meet & greet at Central Festival Chiang Mai on July 12, 2014 as part of Lee Jeans Thailand’s Lee 125th Anniversary celebrations. 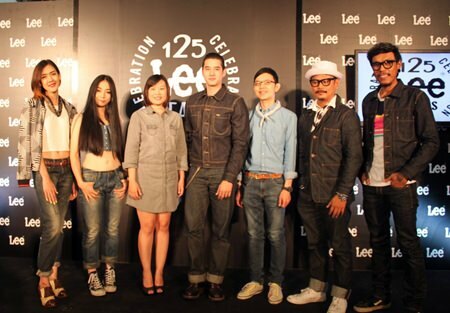 The event also saw the debut of the new limited edition series of jeans M125 Limited Edition, designed by Mario Maurer for the 125th anniversary of the founding of Lee Jeans. 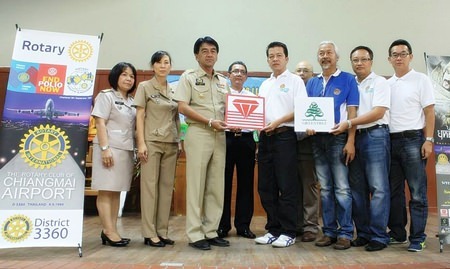 The President of The Rotary Club of Chiang Mai Airport Nopniwat Krailerg was joined by the Club Committee in donating two 2,500 liter Diamond Brand water tanks to Anan Kittirattanawasin, Sansai Chief District Officer on July 17, 2014. The funds to purchase the water tanks were raised by the proceeds from the screening of the Thai film ‘The Legend of King Naraesuan Part V: Elephant Battle’ to purchase six water tanks in total to be donated to San Sai area schools and residents. 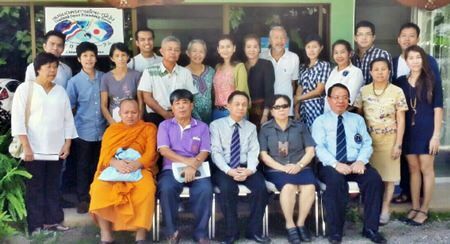 The Thailand-Japan Friendship Committee Chiang Mai joined the conference on preparations for the “Thailand-Japan Friendship’s Poi ceremony” which will be held from November 9 - 10, 2014 at Wat Muen Sarn, Baan Wua Lai. The committee, which met on July 16, 2014, plans on making the event an annual one. 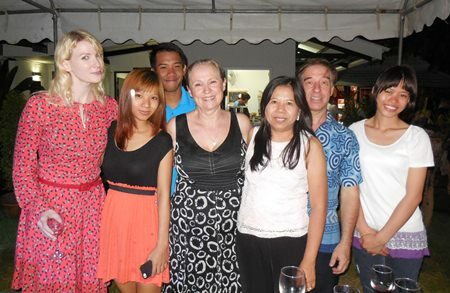 Central Festival Chiang Mai staff joined in a Family Day event at Chiang Mai Zoo and Chiang Mai Zoo Aquarium on July 19, 2014. 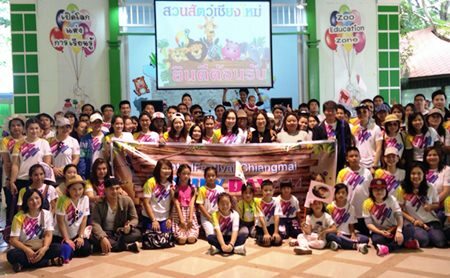 Orachorn Chanwiwatana, property manager of Central Pattana Public Company Limited, joined in the Walk – Rally around the area and Natpimol Reuksasaen, Marketing Director of Chiang Mai Zoo and Apinya Pimsen Marketing Director of Chiang Mai Zoo Aquarium welcomed the group on their day out.